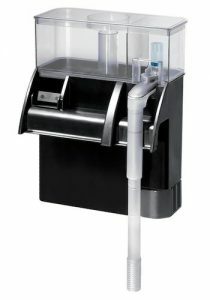 Protein skimmers are an essential part of aquarium health. If you’ve had a tank for a while, then you know this already. If you are new to having fish as pets, this is a very important part of the process that needs to be addressed. A Fish tank protein skimmer works to prevent organic waste from breaking down and help keep nitrate levels low. Some tank filtration systems will claim to be “skimming free” but the best way to fight harmful build up is to implement a protein skimmer in the tank. You’re going to have options when it comes to saltwater protein skimmers and your options are going to change based on the size and overall design of the tank you’ve acquired. 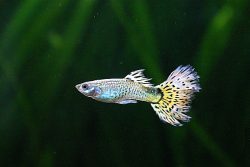 Though some aquarium kits come with small protein skimmers as part of the included filtration system, the majorities do not and you’ll likely find yourself in need of purchasing one. 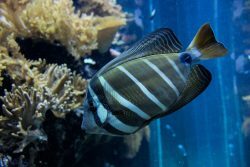 To that end, it’s important to know exactly how protein skimmers work, the importance of using them in saltwater fish tanks, and the best installation designs you can find. As with any piece of mechanical filtration, there are some ground rules to how you should go about doing your research. 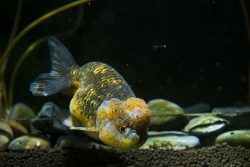 There are different types of pumps that work with different currents, so you’ll want to check any aquarium protein skimmer against the filtration system already in place. You’ll also need to check sizing and placement options. Some can hang on sides of the tank and some need a more integrated placement within the filtration system. It’s all about your research before buying, which, hopefully, this guide will help you to cut down on and help you find the best protein skimmer for your setup. This is an example of a 40 gallon protein skimmer that’s designed to fit in with a preexisting filtration system. Specifically, it fits in perfectly at the back of a BioCube Aquairum design. It’s a quick and simple set up and includes a heavy-duty air pump, air flow valve, skimmer and tubing. As sizing goes, this protein skimmer weighs a littler over a pound which makes it an easy install and won’t add much weight to the overall tank design. Despite being designed for a BioCube, this works in a variety of tanks but it’s sensitive to water level so keep that in mind before dropping it into a tank that’s more than 40 gallons. The only real drawback is it sometimes lacks foaming of protein build up and the pump itself being too small for some larger capacity tanks. But otherwise it seems to work pretty well with a variety of different fish tanks up to 40 gallons. 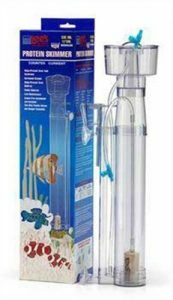 This 30 gallon protein skimmer is a compact little device that makes it a great option for any smaller aquariums, though it can work with anything up to 30 gallons. The placement design allows for it to work quietly as well. The air to water contact on this one is increased by a proven needle-wheel impeller design. 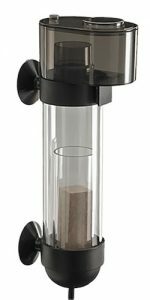 Despite being more compact than the previous design, this mini protein skimmer does weigh almost a half pound more but in the grand scheme of things, it doesn’t amount to much when it’s still under 2 pounds. It’s easy to open for cleaning and the built in channel conceals the power cord. There’s also an option for mounting within the aquarium using the provided suction cups. The drawback on this one is that it isn’t designed for long term use. It is known to start failing after a while of use and even leak a bit. So if you want something that will last you through the years, you might want to go with another model, but it’s a great option for first timers. This design is a counter current protein skimmer. It’s another compact design and comes preassembled to allow for low maintenance in installation and set up. It works with tanks up to 30 gallons and has a height capacity of 12.06 inches. It includes a two-way plastic valve and hanger and is designed to be easily-adjusted when needed. At 11 ounces, it’s the most lightweight so far, weighing just over a half pound. 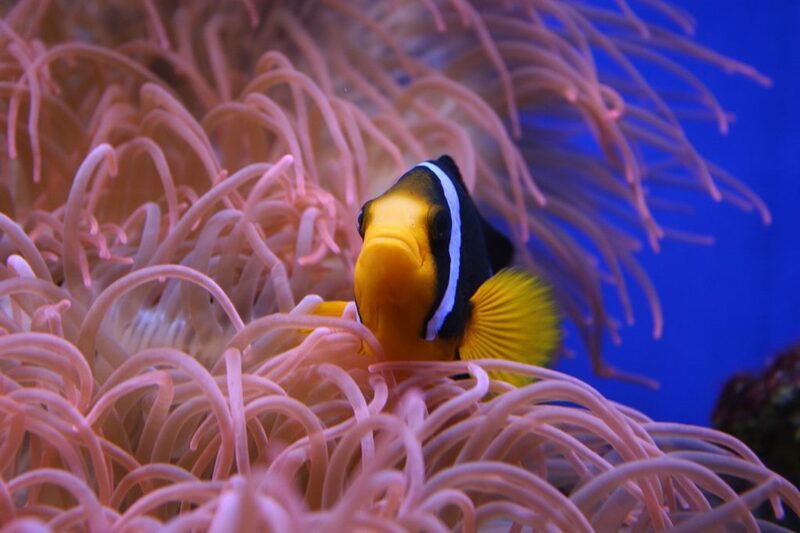 It’s great for use in saltwater tanks and reef tanks. There are plenty of placement options that include suction cups to attach it to the sides of a tank. It takes up a small amount of space of less than 4 inches all around. The drawback on this one is that it isn’t a plug and go unit. There are some items you need to buy to complete the ensemble and get it working, including tubing and a pump. So before you buy, know that you need to purchase some extra items before you can plug it in and start going. Among the protein skimmers on this list, this has the one of the lower water capacity limits of up to 20 gallons. It’s got a footprint of 11 inches all together and has installation options of both interior and sump. It’s got an easy to remove collection cup and the pump is a OTP-200/5 Watt. It’s 1.3 pounds which makes it still a pretty light weight pump. 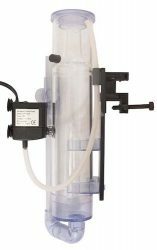 This internal skimmer is equipped with a bubble diffuser, a solid mounting bracket, and a user-friendly raiser pipe. It works with both wet and dry sumps, nano tanks, and full display aquariums (up to 20 gallons). This 20 gallon protein skimmer is more of a starter skimmer than a long term skimmer. It works fine, but the quality is slightly lower compared to other models reviewed in this guide. So if you need a starter protein skimmer, this is a great option, but if you want something that’s going to last you longer, go with another design. 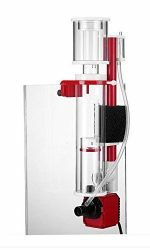 This protein skimmer is designed for up to 35 gallon tanks and, just looking at it, it’s a bit of a more intense protein skimmer we’ve got on this list. It’s highly energy efficient, using only 4 watts of energy. It includes a magnet suction cup mounting system, turning it into a hang on protein skimmer if you so desire to install it that way. It’s got an adjustable air control and foaming level as well. 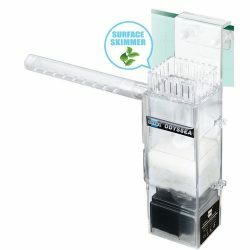 This fish tank protein skimmer is one of the heaviest so far weighing 2.2 pounds It’s designed specifically for nano tanks and mini ref aquariums. It’s got a unique intake design that draws from the water’s surface to reduce bio-slick. The venture air pump adds countless small bubbles for capturing waste in the most concise and encompassing way. It works well but the one flaw in it all is that the installation is not as simple as you’d like it to be and the user guide doesn’t help much on that end. So if this is your first tank, you might want to seek some assistance before you dive in to assembling it yourself. But once put together, it’s an excellent protein skimmer. This is a slightly different design on the protein skimmer than what we’ve seen so far. It forgoes the compact, cylindrical design for a wider design. It utilizes a needle wheel and intake venturi that’s highly adjustable. It also included a filter cartridge with carbon for capturing toxins. It weighs just under 2 pounds and doesn’t feature the most compact or easy to place design. The installation, however, is simple and can work for tanks up to 20 gallons, filtering through 110 gallons per hour. The only option is to use it as a hang on skimmer so keep that in mind before purchasing it as well. The drawback to this nano protein skimmer is the amount of bubbles it produces, which can be cumbersome. It also isn’t so easily adjustable once placed on the tank. So it might be a bit of a cumbersome choice if you want something more compact and easy to adjust. This is a protein skimmer that works for tanks up to 40 gallons. It includes built in red and white pipefittings to help you identity components easy and quickly, as well as add some aesthetic flare to the overall design. It’s got a highly efficient pinwheel pump and has a cone reaction chamber to help collect bubbles efficiently. The design renders a small footprint area. All material is from impact resistant high quality acrylic. It’s on the heavier end of the spectrum at 2.6 pounds and can only be placed as a hang on protein skimmer. While it can only do up to 40 gallons, it’s recommended for nothing below 15 gallons on the other end of the spectrum. The air intake has a max of 180L/H. There’s no variable placement options for this protein skimmer, it’s an internal hang on protein skimmer only and is a US only power plug. Otherwise, it works well, is user friendly, and looks pretty good while doing it. This is another slightly out of place design. It still utilizes the compact tall design but has some components sticking out in odd ways. It’s got a great flow rate of 110 gallons per hour and an energy efficient pump that runs on 5 watts of electricity. It skims the surface constantly for bio-slick and is great be use in saltwater and marine aquariums. It’s pretty lightweight, weighing just under a pound and includes everything you need with no additional purchases for components necessary. It improves the water quality with the removal of nutrient build up, oxygen exchange, and light penetration. Using it below a 20 gallon tank could result in the need to clean and change it often, so it’s best for higher up on that spectrum. This pump works great but it does come at the price of noise, being one of the louder protein skimmers on this list. It’s also highly temperamental to water level so you’ll want to make sure you’re being as exact as possible where that is concerned. There’s a lot that goes into keeping a fish tank clean and healthy and a protein skimmer is a huge part of that. You’ll want to make sure you have one that works and works well. Other parts of this include checking the noise levels, the water levels, how much energy it uses, etc. But the most important thing is to get a protein skimmer that’s safe for the size and type of tank you’re using. Watch for warnings and downsides while shopping and get yourself the best protein skimmer option you can, and possibly even a cheap protein skimmer, to make a happy home for your fish! Let us know in the comments which one you plan to go with or if you have any questions.